July - a time for rodeo, parades, fireworks, bon dances, and lots of guitar concerts. Also, help break ground on Maui's first trout farm. Please visit the websites to make sure the event dates, locations and times are still correct. Abbreviations: MACC stands for Maui Arts and Cultural Center. 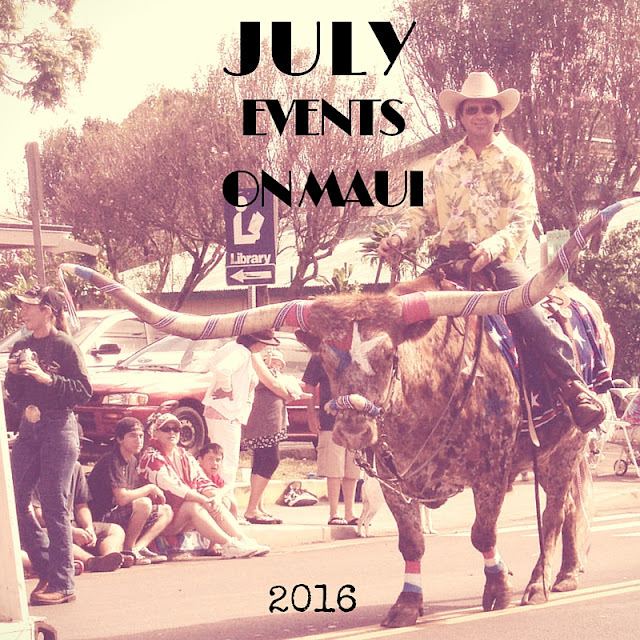 For a list of ongoing Maui events, which are held monthly, scroll to the bottom. Click here for a Maui Bon Dance Schedule. Thursday, June 30 – July 3. Makawao Rodeo! Rodeo, entertainment, food and fun. Oskie Rice Arena, Makawao. Pre-sale tickets available at all Minit-Stop stores. Saturday, July 2, 8:30 am. 51st Annual Makawao Parade. The Stick Horse Race at 8:30 am is for all ages and the Grand Paniolo Independence Day parade begins at 9 am. The theme for this year’s parade is “Honoring our Heritage.” The Maui Veterans Council will march with a Color Guard along with Hawaiian Pa`u Riders. Grand Marshalls are brothers Henry Rice and Freddy Rice to honor their father Oskie Rice and to also honor the 100th anniversary of Kaonoulu Ranch. FREE! Saturday, July 2, 6 pm. Wooden Crate Cabaret with Ron Artis II. An evening of music and storytelling with a garden to table dinner. Lumeria, Makawao. Saturday, July 2, 12:30 – 2:30 pm. Ka`ana Kupboard Cooking Classes: Shellfish. Learn how to do more than steam or boil your shellfish, with tips on how to buy shellfish. Andaz Maui, Wailea. Sunday, July 3, 1 pm – 5 pm. Jazzy Sunday. 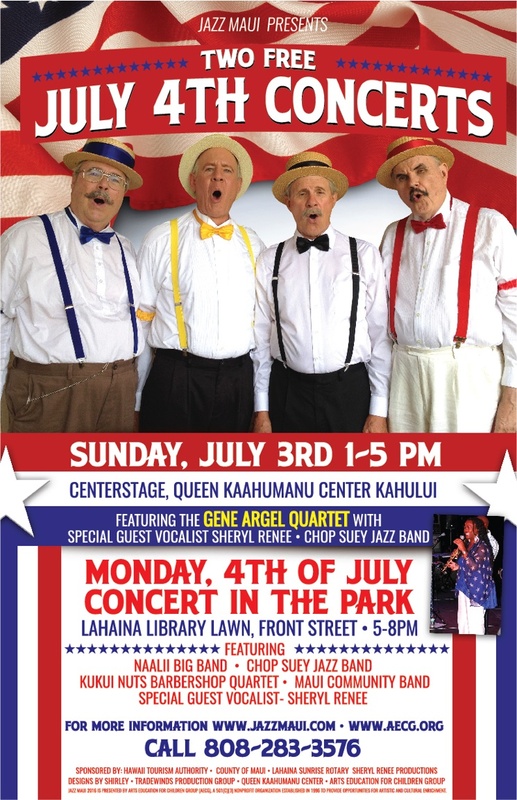 Jazz Maui Presents their first Fourth of July Concert. Queen Kaahumanu Center. FREE! Sunday, July 3, 7 pm – 8:30 pm. Maui Improv with Geoff Grimwood. Special improv theater performance with a guest teacher from NYC. Tickets are first come, first serve. Pro Arts Play House, Kihei. $5. Monday, July 4, 11am – 1 pm. 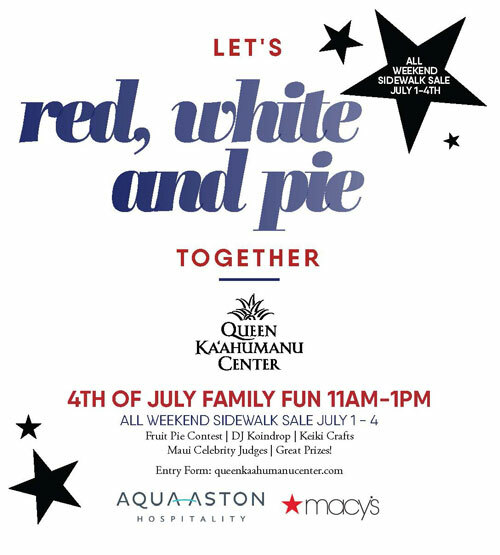 Let’s Red, White, and PIE Together! Fruit Pie Contest with great prizes. Queen Kaahumanu Center. Entry forms are due July 1. Free to enter. Monday, July 4, 9:30 am – 9 pm. 4th of July Celebration in Lahaina. Enjoy historic Lahaina town, specials at shops and restaurants, live jazz music and entertainment, craft booths and family fun. Free fireworks at 8 pm. FREE. Monday, July 4, 4 pm – 10 pm. 4th of July Clambake. Enjoy a summertime clambake on the Anuenue Lawn of the Sheraton. Clambake kit includes seafood, corn on the cob, Portuguese sausage and potatoes + salad, dessert. Enjoy live music and lawn games while chefs prepare your clambake kit. $40/kit pre-sale. Sheraton Maui, Kaanapali. Monday, July 4, 5 pm – 8 pm. 4th of July Concert In the Park. NaAlii Big Band, Chop Suey Jazz Band, Kukui Nuts Barbershop Quartet, Maui Community Band Special guest vocalist- Sheryl Renee. Fireworks at 8 pm. Lahaina Library Lawn. FREE! Benjamin Verdery, David Leisner, Ian O’Sullivan, and Simon Powis will perform a special concert to open the week. The program will include compositions by Verdery, Leisner, O’Sullivan, Ginastera, Mertz and others. Suggested donation is $10, with proceeds benefiting the Boys & Girls Clubs of Maui, Makawao Clubhouse. Friday, July 8 – Sunday, July 31. Monty Python’s Spamalot. Lovingly ripped off from Monty Python’s The Search For the Holy Grail, this musical tells the story of King Arthur and the Knights of the Round Table along with cows and killer rabbits and show girls. Saturday, July 9, 9 am – 1 pm. Weaving Workshop. From hats and bags, mats, to bracelets and headbands, few hand woven accessories are so subtly stunning as those made of lauhala. Master Weaver, Pohaku Kaho‘ohanohano, will teach participants about the history of hala weaving and preparing leaves for plaiting. Attendees will create a lauhala treasure to take home. Maui Nui Botanical Gardens, Kahului. $25 Members, $50 Guests (includes 1 yr. membership). Sunday, July 10, 2 pm. Guitar Concert in Kula. A free concert featuring performers from the class. Husband-and-wife duo John Olson and Gioia De Cari will perform a new piece for guitar and soprano by David Leisner, based on texts by Mark Twain; and guitarist John Bogan will perform music by Ponce, Johanson, and Legnani. St. John’s Episcopal Church, Kula. FREE. Tuesday, July 12, 7 pm. Guitar Concert in Lahaina. Class participants will perform a free concert with solo performances and pieces for guitar orchestra conducted by Mr. Verdery and Mr. O’Sullivan. Lahaina Jodo Mission. FREE. Wednesday, July 13, 7 pm. Guitar Concert in Makena. Class participants will perform a free concert with solo performances and pieces for guitar orchestra conducted by Mr. Verdery and Mr. O’Sullivan. Keawala’i Congregational Church. Makena. FREE. Wednesday, July 13, 6 pm – 9 pm. Maui Primary Election Candidate Forum #1 – For State Elections, organized by Hawaii Farmers Union United. Get to your candidates’ positions on agriculture. Hannibal Tavares Community Center, Pukalani. Stop by and "talk story" with Umi Kai of Kai Kompany and Leinaala Kai of Ulupono Designs! We encourage you to ask questions and watch them create some of their own work! This is a great opportunity to learn about tools, weapons, and lauhala weaving from Native Hawaiian artists. Hui Noeau, Makawao. Sunday, July 17, 9 am – 4 pm. Kiawe Harvest Camp by donation. Learn to select and gather the edible kiawe bean with Sunny Savage. Launiuopoko. The craft of using cordage or rope to bind materials together was highly developed in Hawaiian culture. In this class, students will explore fibers from a variety of native plants and learn a various techniques for making cordage with Kumu Lisa Schattenburg-Raymond and Lei Ishikawa. Maui Nui Botanical Gardens, Kahului. $25 Members, $50 Guests (includes 1 yr. membership). Saturday, July 23, 12 pm – 4 pm. 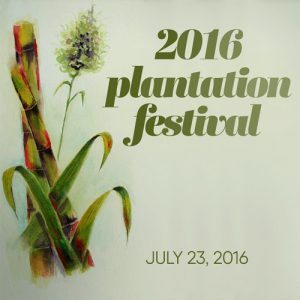 Plantation Festival to honor Hawaii’s varied cultures. Receive a passport and get it stamped by visiting each booth. Giveaways and entertainment. Queen Kaahumanu Center. Free. Saturday, July 23, 9 am – 1 pm. Talk Story on the Land. Pu‘uhokukano in ‘Auwahi An excursion to ʻUlupalakua Ranch’s historically rich property in Kahikinui district. Bring sturdy shoes, long pants, plenty of water & lunch. Moderately difficult. Let by HILT Interim Executive Director, Scott Fisher. Saturday, July 23, 9 am – noon. Ridge to Reef Rendezvous. Catch and release papi’o tournament (register at 8 am), look at interactive displays, culinary contest, and more! Kahekili Beach Park, N. Ka’anapali. FREE! Saturday, July 23, 1 pm – 4 pm. Bringing History to Life. Family Enrichment Program by Maui Historical Society. Call 244-3326 or email info@mauihistoricalsociety.org. Free, donations welcome. Sunday, July 24, 9 am – 4 pm. Kiawe Harvest Camp by donation. Learn to select and gather the edible kiawe bean with Sunny Savage. Papalua. Wednesday, July 27, 6 pm – 9 pm. Maui Primary Election Candidate Forum #2 – For Maui County Council, organized by Hawaii Farmers Union United. Get to your candidates’ positions on agriculture. Baldwin High School, Multi Purpose Room, Wailuku. Friday, July 29, 7 pm – 9 pm. 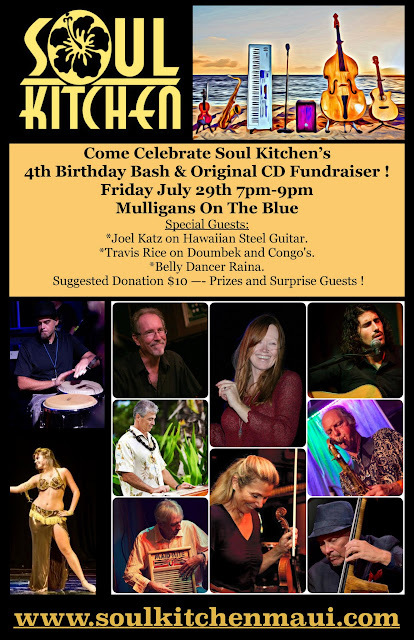 Soul Kitchen Maui’s 4th Birthday Bash & Original CD Fundraiser. In addition to Soul Kitchen’s usual acoustic alchemy and musical mayhem, special guests Joel Katz on Hawaiian Steel Guitar, Travis Rice on Doumbek and Congos, and Belly Dancer Raina will join in the fun for a night of great music, food, drink, as well as other surprise guests, prizes, and birthday cake! Mulligan’s on the Blue, Wailea. Suggested donation $10. Friday, July 29 – Saturday, July 30. The Mayjah Rayjah Music Festival. This popular reggae music festival returns to the MACC. Saturday, July 30, 1 pm – 4 pm. Bringing History to Life. 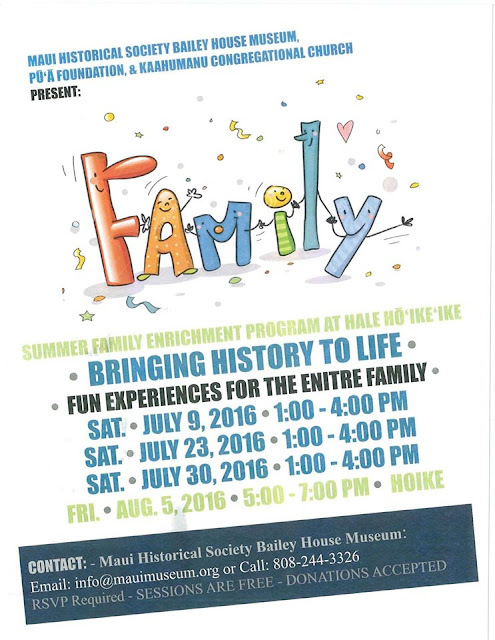 Family Enrichment Program by Maui Historical Society. Call 244-3326 or email info@mauihistoricalsociety.org. Free, donations welcome. Sunday, July 31, 9 am – 4 pm. Kiawe Harvest Camp by donation. Learn to select and gather the edible kiawe bean with Sunny Savage. Keanae. Last Sunday of the month, 7 pm – 8:30 pm. Maui Improv. Live, improvised theater. Tickets are first come, first serve. Pro Arts Play House, Kihei. $5. Third Wednesday of the month, 6:00 pm: Wailea Lea – Concert or event with festivities and art galleries. Visit their Facebook page for updates. Last Thursday of the month: Hawaiian Music Series. Baldwin Home Museum Lawn, Lahaina. 6 – 7:30 pm. FREE! Labyrinth walks, on or near the full moon each month and on Thursday afternoons at the Sacred Garden of Maui, Makawao.